* Texas smells different--Driving I-40 into Texas late at night, it was nearly impossible to tell that the long boring stretches of western Oklahoma prarie/desert (steppe?) had become long boring stretches of eastern Texas panhandle. Of course it was dark, and the bus droned on with the same flatness and straightness of road. However, Texas smelled different for some odd reason, a funny sweet smell of sage, cattle, tumbleweed and a hint of crude. After some time, the droning turned to groaning as the bus struggled with the wind or maybe clogged fuel filters. Hours later, upon entering New Mexico, we somehow arrived at an elevation of 5000 feet. We must have been climbing the whole way through Texas and didn't even know. * Largest cross in the Western Hemisphere--Sunday morning, somewhere just east of Amarillo, an enormous white cross appeared on the horizon that could be seen for miles. Gotta see it to believe, a billboard said. The largest Jewish star in the Western hemisphere was nowhere to be seen. Have you reached Albuquerque yet? If so be sure to visit Padilla's New Mexican Restaurant at 1510 Girard NE. Take the Carlise exit off I-40, go south one block, make a right on Indian School Road. GO about 1/2 mile and make a left on Girard. It is in a little strip mall on your left in the first block. It is my favortie New Mexican food. Little family run place for years. Only known by the locals. Get cheese or chicken enchiladas with the red sauce and a chile relleno withthe green sauce. Watch out, it can be HOT, and the chile is definitely habit forming. My goodness, what happened to those Caddies since I was a kid? 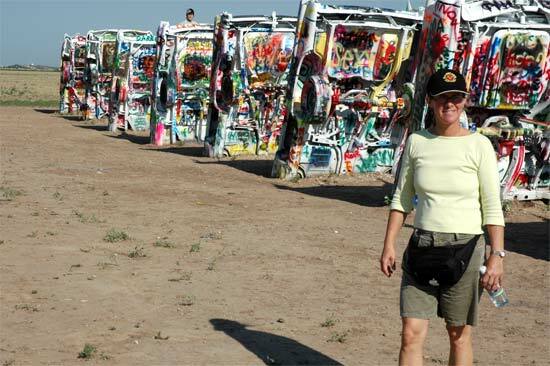 I remember driving through Amarillo with the family in the mid-70s and the cars looked freshly painted, one a lemon yellow and I think a couple of other bright colors as well. A little disappointing if they all look the same now!